Barry Faircloth, associate athletic director for development, was formally recognized June 16 as the 2015 National Association of Athletic Development Directors (NAADD) Fundraiser of the Year. Faircloth was presented the award at the National Athletic Administrator Convention in Orlando. It had been announced last February that he was the recipient for 2015. 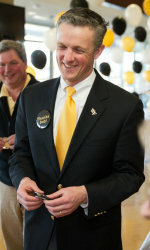 A 1993 Wake Forest graduate, Faircloth is credited by University leaders with transforming fundraising efforts in the Athletics Department, with a focus on major gift fundraising, strict accountability with development staff and the creation of volunteer committees to involve and assist in the development process. “Barry has recruited an outstanding volunteer leadership team, arranging each member as the leader for one of the major campaign priorities. He expertly managed their energies and guided them to unprecedented success. With multiple concurrent and ambitious facilities projects underway in the early years of the Wake Will campaign, the organization and mobilization of campaign volunteers was essential. Barry’s vision, strategic thinking and compelling passion provided the driving force to make each project a reality,” said Mark Petersen, vice president of advancement. Faircloth has been a leader within the Atlantic Coast Conference development, serving previously as chair of the ACC Development Directors. He is also leading an initiative of Fan’s First within the ACC as an effort to carry the voice of fans and donors in a unified way to the conference athletic directors. Most notably, Faircloth led an effort by the ACC development directors to move the ACC Tournament from a domed venue to an arena. Faircloth serves on various boards in the community including Hospice Palliative Care Executive Committee member and co-chair of the Triad JDRF Golf Tournament. He joined the Athletics Department in 2001 and was named the next year as associate athletic director of development.